Cruising the Caribbean is tons of fun! Right now we are in Fort Lauderdale and I thought I'd show you a couple of images of our vacation. Katy and The Mr. play in the incredible blue water and white sand at Half Moon Cay in the Bahamas. My Sis and I with the ship in the background. I could stay on Half Moon Cay a while I think. We did not proceed beyond the sign. Even though it didn't look that dangerous. 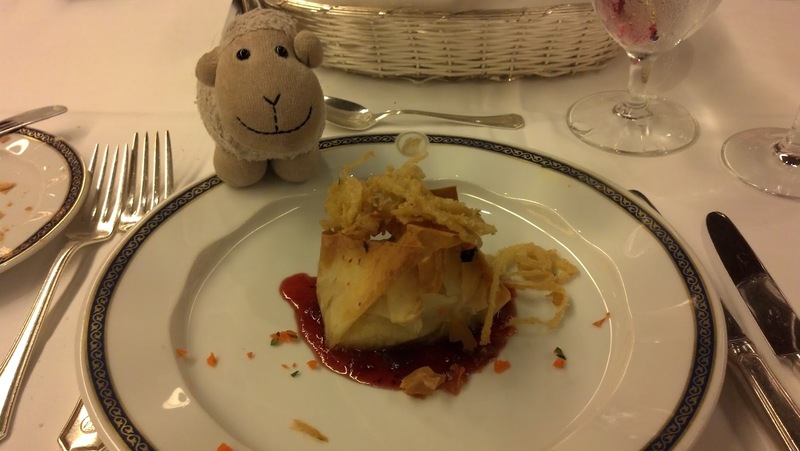 And Sheepy is enjoying so much great food! Baked brie. One of his favorites. While in the Bahamas, Sheepy insisted on having a Bahama Mama. That's a lot of drink for a little guy! We're enjoying ourselves, relaxing and rejuvenating. One more whole week to enjoy. We'll be in Grand Turk, Puerto Rico and St. Maarten next week - check on back to see how we're doing!